Hey all you people who just finished marching this summer! We're running out of Forzato pics! 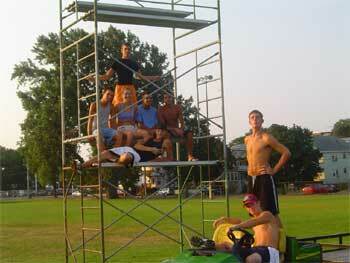 Hurry up and e-mail your best shots from the summer to dave@dci.org along with where and when the photo was taken. Send some biographical information about yourself as well. We'll give you full credit. Also, let us know if you want your e-mail address included. Kristen Chinn, a trumpet player with the Magic, sent in this one. "I was a vet from last year, and this year joined in the middle of the season to fill a spot, and when I did I joined scaffolding crew. It was such a great group that even though we set up and took down the scaffolding three times in one day, I always enjoyed it. By the time I came they had perfected the art of setting it up, so it was always quick and a lot of fun. This picture was taken in Lynn, Mass., at our last rehearsal on the day of quarterfinals. Thanks!" Thanks Kristen!